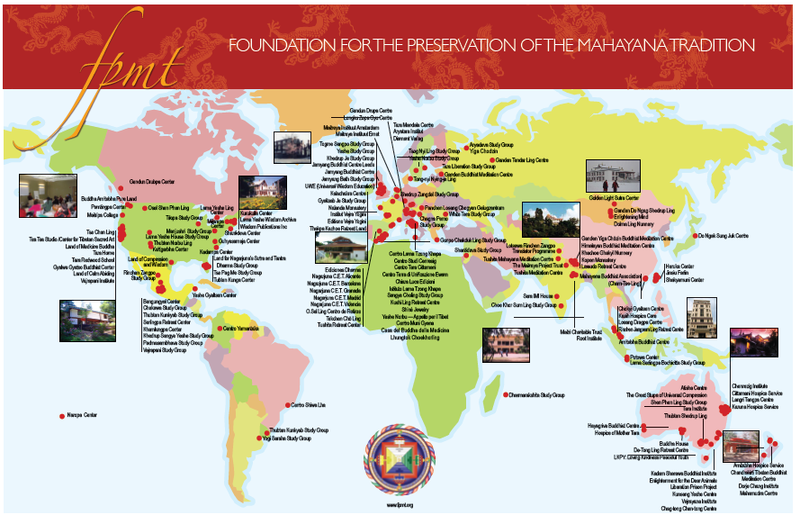 The Foundation for the Preservation of the Mahayana Tradition is an international, non-profit organization, founded in 1975 by Lama Thubten Yeshe (1935-84), a Tibetan Buddhist monk. The Foundation is devoted to the transmission of the Mahayana Buddhist tradition and values worldwide through teaching, meditation, and community service. We provide integrated education through which people’s minds and hearts can be transformed into their highest potential for the benefit of others, inspired by an attitude of universal responsibility. We are committed to creating harmonious environments and helping all beings develop their full potential of infinite wisdom and compassion. Our organization is based on the Buddhist tradition of Lama Tsongkhapa of Tibet as taught to us by our founder Lama Thubten Yeshe and spiritual director Lama Zopa Rinpoche. Every living being has the potential to be free from suffering and to develop limitless love and compassion for others. Working to help human beings fulfill this potential are the FPMT meditation, retreat and study centers, monasteries, publishing houses, businesses and students. The FPMT strives to follow the example and inspiration of His Holiness the Dalai Lama in his compassionate service to humanity.